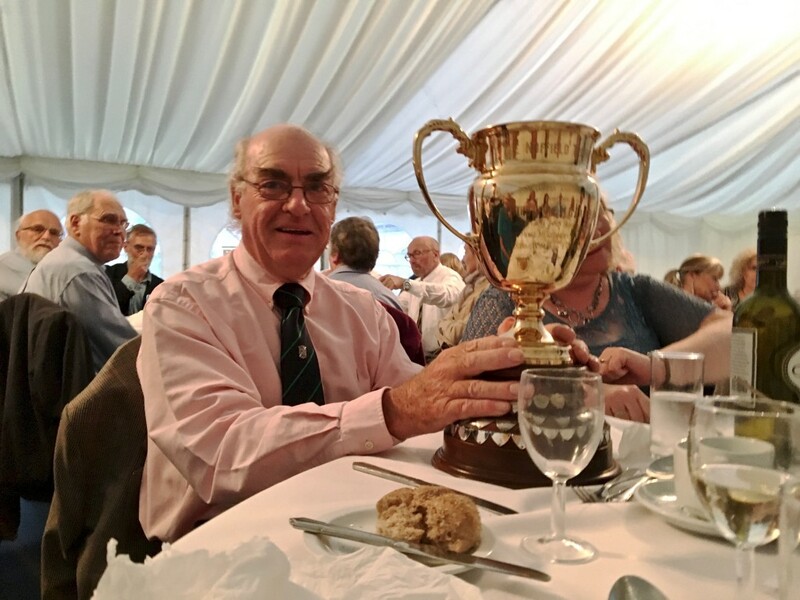 We won the Nuffield Gold Cup! 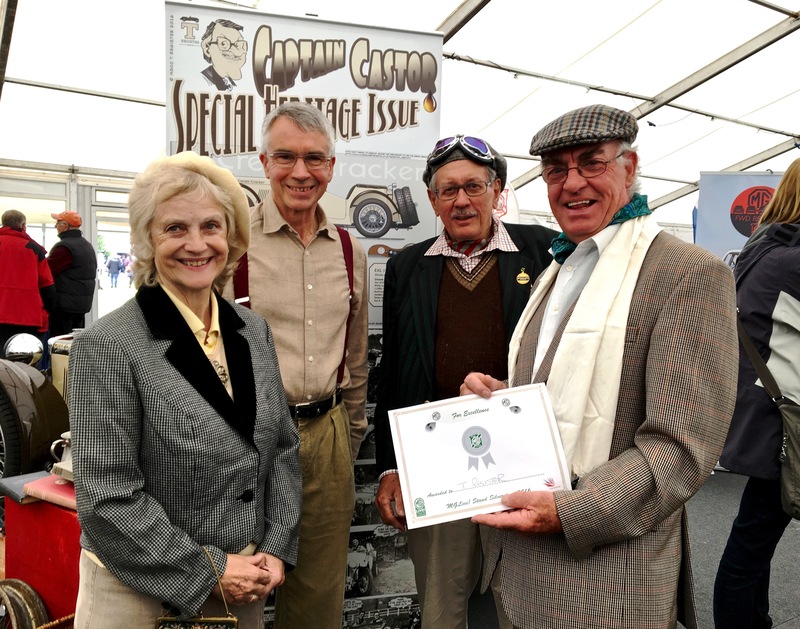 Not only that, we came second in the competition for best stand in the main marquee. So all-in-all, we had quite a successful weekend. Not surprising that they look pleased with themselves. 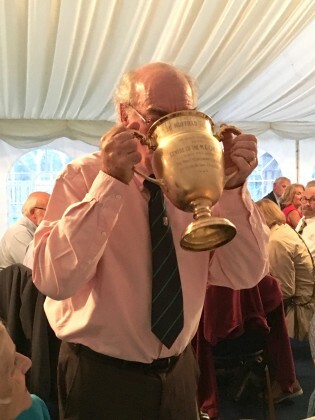 Geoff Matthews, our Chairman, was totally taken aback at being awarded the Nuffield Cup at the President’s Dinner, and had to take some time to compose himself before making a speech. It was awarded for the work put in to rejuvenate the T Register. He did, however, find time to sample the bubbly that the Cup was filled with! By the way, you can see the full picture of the Captain Castor poster on the Captain Castor page on this website. 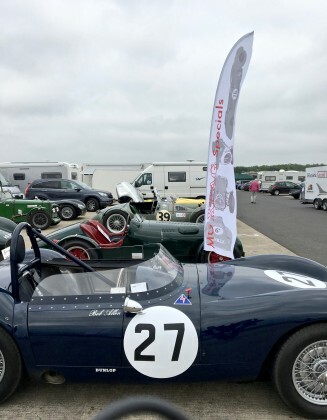 Stewart Penfound put on a great show of XPAG Specials in the paddock once again, and these and the T Types were in action on the Silverstone Grand Prix track on the Saturday afternoon. There is a full report and pictures of the racing on the T Register’s Facebook page, courtesy of Colin Murrell. The T Register will have quite a presence at this year’s MG Live! and to be successful, some of the items are dependent on an input from yourselves. 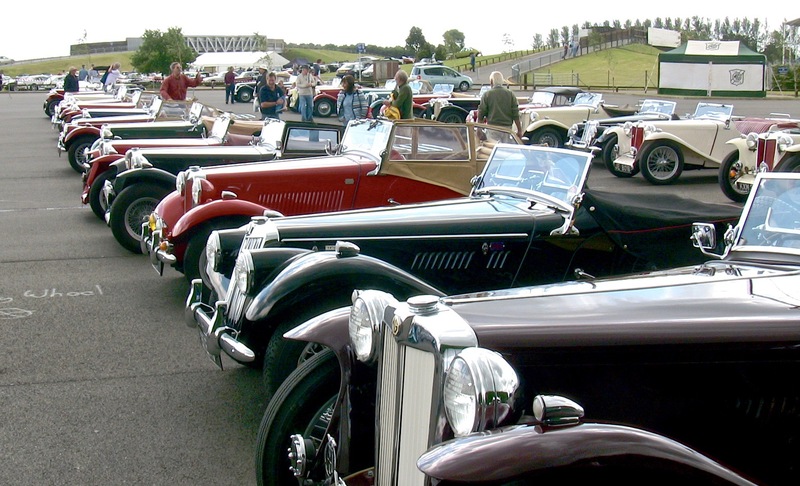 For a start we will have the popular Register parking, ably organised by John Ward (he is always gets more T Types turning up than he has spaces for but is quite adept at borrowing more space from other Registers!). 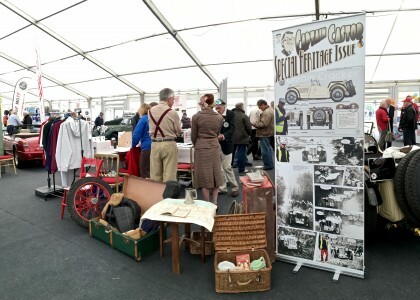 Then there is the T Register stand in the main marquee. We won the prize for best stand in 2014, but were beaten in 2015 by the Caledonian Centre who imported fake snow – in June. On the track on the Saturday will be the T Type racers in the Iconic series and the XPAG Specials in the FISCAR Fliers series. For the Saturday evening, Bill Silcock is organising a T Register table at the President’s Dinner – it’s actually a good do! So contact him if you wish to go. There will be a celebration of the 80th anniversary of the introduction of the TA in the main arena on the Saturday. 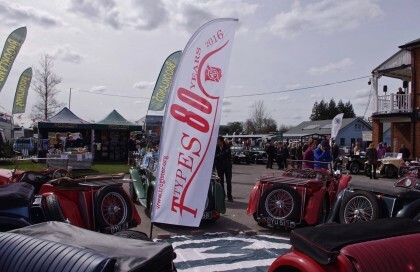 Alan Wakefield organised a great show of TAs and TBs at MG Era day Brooklands in April and we’d really like all the participants there to also take part in the area celebration at MG Live. John Ward is organising the display this time, so you know who you are, and it would be great if you could contact John and come along and take part. And finally we have had a plea from the club about entries for the California Cup at this year’s MG Live! The entries are woefully down and yet this competition has been running continuously since 1959 and always organised by the South West Centre. The plea has gone out to all MGCC Centres and Registers to provide a team of three cars to participate. It’s held on the Saturday morning in the large car park to the left of the main entrance. designed to provide a challenge to the modified Midgets while at the same time providing plenty of fun for the more sedate vehicles. 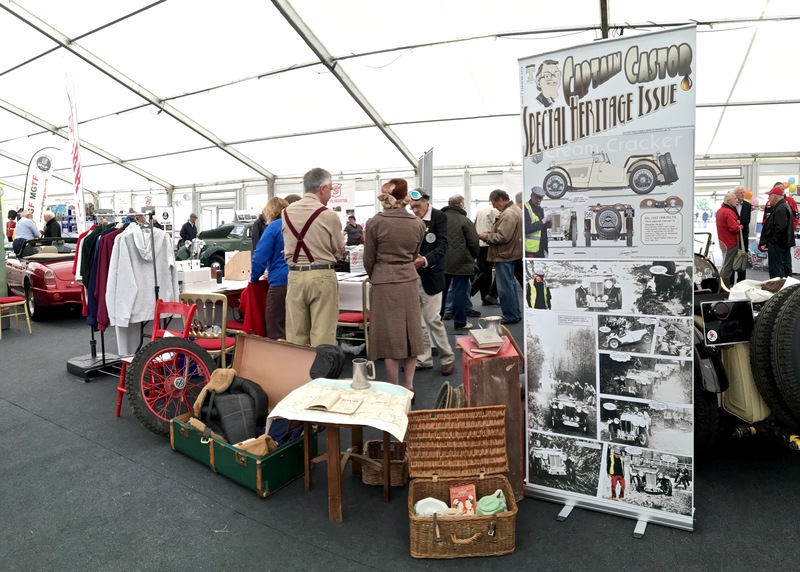 The event is fully marshalled, so there’s no hopping in and out of cars – unless you want to take advantage of the best coffee shop at Silverstone! 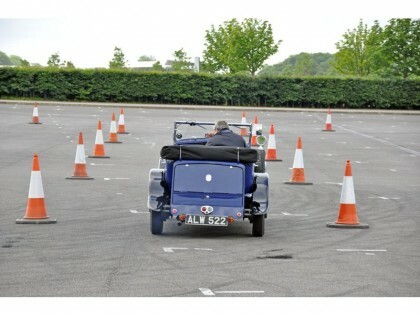 If you think you’d like to have a go, The T Register is looking to enter a team of three cars – contact Sally Silcock if you’re interested. You can read more on the California Cup on the club’s main website. Keep your eye on the MG Live website for up-to-date information – and here’s the link for the tickets.